One of the many sinking wooden houses. Tomsk is known for it's 'wooden lace' architectural details. Children build a fort in the snowy banks of the River Tom. Soviet Oppression Museum, housed in the former KGB headquarters in Tomsk. After 3 nights sleeping on the train, (and wearing the same clothes) we were happy to check into the hostel in Tomsk. We set out to see all of the wooden architecture Tomsk is famous for, and found a couple "wonderfully dilapidated" wooden buildings with intricately carved eaves, window and door frames. Like Tobolsk many of these buildings seem to be sinking into the ground to the point that some of the windows are now below ground level. Unlike Tobolsk most of the buildings seem lived in. We had coffee and breakfast at our favorite Russian coffee chain "Traveler's Coffee" where we met a guy who told us he was an English teacher and could help us translate if we wanted. By the end of the meal he had talked us into coming to his advanced class that night to talk about America with his students. We did some more wandering, looking for old buildings. Matt spied on some little boys building a fort in a junk pile by the river, but I wouldn't let him go join them. 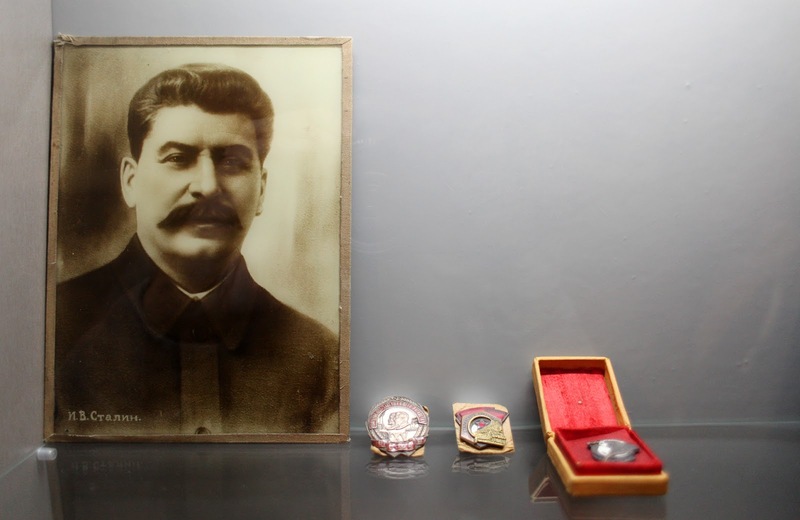 We also went to the Opression museum, dedicated to all the scholars, activists, priests, scientists and artists who were interred (some executed) at the gulags closest to Tomsk. It was a beautifully designed museum housed in the former KGB prison/interrogation rooms. It was very moving, even if there were only about 25 sentences in English total. I guess I didn't realize people were getting sent to the camps from the teens through the 80's. They had a sample gulag cell, and a map of all the gulags across Russia, as well as pictures of the projects the inmates worked on, including the railroads we've been traveling on. We briefly looked at the monuments to all those oppressed by uncle joe, then headed off to class. The class was about 12 girls and one guy, mostly all students at one of the 6 local universities. Their English was good, and they mostly asked us about our impressions of Russia so far. They also asked if we/Americans had any pre-conceived ideas about Russia. We told them that people were not drinking nearly as much vodka as we expected (Matt was resolved to being forced into doing shot after shot on the train) and that Siberian cities were not quite the wastelands we had expected. I tried to tactfully bring up the stereotype of Russian mail-order brides, but they may have been too young to discuss that. We tried to follow the guide book's advice and go to a pizza and beer hangout called People's bar and grill. Unfortunately they don't serve beer, but we talked the English speaking bartender recruited to serve us into putting some water with gas in some vodka, sacrilege I'm sure.